A female conductor of the tramways department of the Corporation of Glasgow (now Glasgow City Council) standing at her vehicle. Clarke begins in pointing out that women’s employment during the First World War was novel, as opposed to typical. This ‘novelty’ is reflected in the many photographs of working women that were published during this time: from public service roles to munitions, the Women’s Army Auxiliary Corps (WAAC), the Women’s Royal Naval Service (WRNS), the Women’s Royal Air Force (WRAF) and the Women’s Land Army (WLA), to name a few. Indeed, the majority of government-commissioned photographs presented an ‘ideological filter’ on women’s labour. The war had created some opportunities for women, although these were not extensive and often did not outlive wartime. Despite the fact that some women worked in different roles from their pre-war work, there was relative homogeneity in women’s occupations during the post-war period. 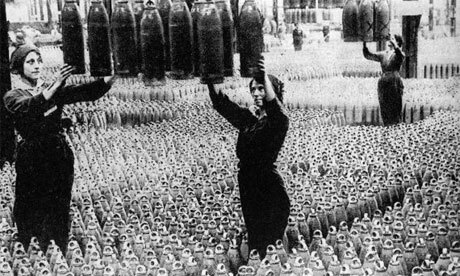 First World War Women Munition Workers. In order to understand the impact of the war on women’s work, we need some idea of what the situation was like before the war. It is difficult to measure the female labour participation rate before the war, but estimates suggest that 400,000 to 600,000 women entered the wartime labour force with some previous experience of employment, most notably in domestic service. Before the First World War, much of the work carried out by married women was unrecorded, making them into a ‘shadow economy’. Hence, while photos may characterise women’s work as ‘novel’, the wartime reality was different. An officer of the Women Police Patrols collaborating with male police constables. The work might not have been new, but the wages certainly were. Women’s wages increased from the pre-war average of 13s 6d per week, to the wartime average of 35s. This enabled women to meet with other like-minded individuals, while gaining financial and social integration, as well as independence. Consequently, some women felt as though they ‘had been let out of a cage’ and were now ‘standing on their own two feet.’ This aspect of women’s labour should not be neglected, as it is by Clarke, when investigating war’s potential to transform women’s lives. Although this was not captured on camera, it should not be ignored. Nevertheless, women only benefitted from these higher wages in the short term. The majority of women were trained as dilutees, and so the work was repetitive and dull. The first dilution agreement (the Crayford Agreement in November 1914) restricted women to repetitive work in the munitions industry. There were some attempts at equal pay under Lloyd George, yet despite these agreements, male prejudice in the workplace limited women’s gains. Employers wanted to protect male skills and wage rates, thereby limiting women’s opportunities. Underpinning this treatment of women was the belief, held both by men and women, that women were ‘meantime’ workers who at the end of the war would return to their homes. It did become acceptable for women to work part-time, but this belief that a woman’s place was in the home remained relatively unchanged. Women campaigning against the Unemployment Insurance Act in 1920. Still, experiencing war altered some women’s deference to traditional bastions of female employment. In the immediate post-war period, young women in particular refused work in domestic service. Having tasted other employment, more women became critical of the degrading nature of this work. Government cuts to women’s unemployment benefit however, forced them back into domestic service, leading to a 40% increase in 1919 compared with the previous year. In spite of this, a growing body of domestic servants refused to live in their employers’ homes. Some went out in the evening without permission – unheard of before the war. Change was clearly on the rise, but limited only to a few sectors. Returning to Clarke’s statement, we can agree that on the whole, employment opportunities offered to women were not astronomical. War enabled women to undertake a number of roles in a variety of sectors, but the work itself was mostly unskilled and gave women very little opportunity to progress. The most notable gains benefitted single women, in sectors which were already flourishing before the First World War. This is distorted by the photos of women’s war work, which featured younger women carrying out unusual roles. Nonetheless, Clarke’s study should be nuanced enough to consider the increased independence and social opportunities that war work offered. This added sense of self-worth and versatility outside the home is difficult to measure on a larger scale; yet there are indications of a change in women’s approach to their homes, careers and social lives. The First World War set the foundation for change, which was to be built upon and strengthened during the Second World War. Early Modern England: A Literate Culture?